We want to host your next event in our space! Our studio is an open light-filled space in San Francisco's SOMA district, measuring 6000 square foot (according to our landlord). Refinery 29 dubbed it one of "SF's coolest start-up offices" and it's been featured in the SF Chronicle and Officelovin', as well as in the background of all our product photography. Space + Plants + Ink + Beer + You? The space is dynamic and open, with movable barriers, projection walls and stage platforms. We have a ton of plants, a baby grand, a music room, library, restroom and shower facilities, and three lofts for reclining or taking a disco nap. We also have an all-purpose photo studio and can offer you instant printing capabilities. We've mucked about with drones a bit here too. In the past we've thrown happy hours, parties, blog meet-ups, movie nights, clothes swaps, performance art pieces, recording sessions with Yours Truly, and a Boiler Room concert with Toro y Moi. 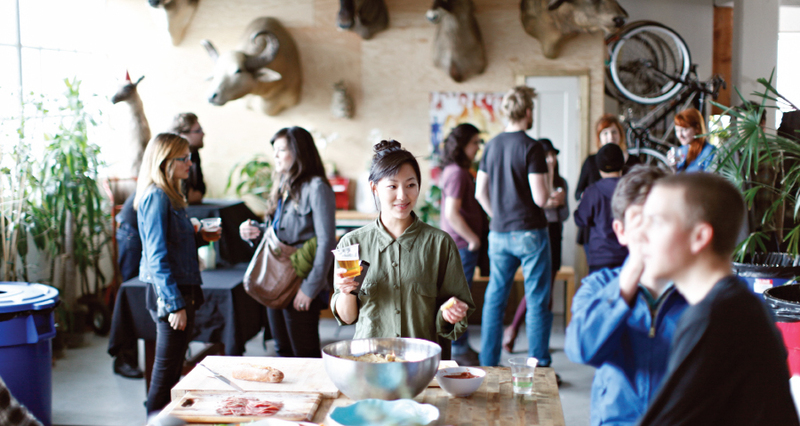 We've co-hosted events with our local friends Lumio, Mixed Nuts, and Room & Makers. Beer and alcohol sponsors can be arranged. To find out more about renting or collaborating on an event, get in touch with us and we can work out an arrangement that will be mutually agreeable to all parties.